Do you remember OpenTTD? Simutrans is a similar game. It’s a tycoon game and we need to make a lot of money. We have a transport company and we must build lines for buses, trains, planes, trucks and boats. Unlike OpenTTD, Simutrans isn’t a clone, it’s a game that evolves as users request. It was developed by Hajo, but now a team does the dev work. The game is managed using the mouse as usual in many tycoon games. ResidualVM is an open source engine for 3D graphics adventures like Grim Fandango and Escape from Monkey Island. It was developed to run LucasArts adventures not supported in ScummVM , like those developed with the GrimE engine. Both of them have a very similar GUI, though ScummVM has a far more support for 2D games than ResidualVM for 3D games (only a few are playable). You have to have an original copy of the game, as ResidualVM is only an engine, with no datafiles from the games. Diamond Girl is a single player, puzzle/action game. 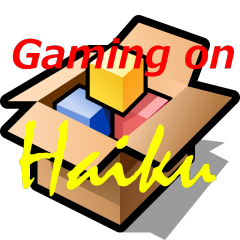 Originally designed for BeOS by Jarko Nikkanen, now it’s available for free on Haiku. In this game we must collect the required amount of diamonds. However, there are some dangers in the field and we must be careful (and quick!). Move the girl using the arrow keys. You can go wherever you want, unless there’s a rock. Pay attention to your route, because the places where you have been before are marked as digged, so rocks can now move through those tunnels. LBreakout 2 is a clone of Atari’s Breakout made in SDL. With more than 50 levels it’s a very challenging game. It is part of the LGames suite of games (LMarbles, LTris, Barrage). The game won the No Starch Press SDL contest. You control a platform at the bottom of the game board. It’s like a trampoline. When a ball (because there might be more than one ball) hits the platform, the ball jumps again.